This article is about the character. For the guest star, see Lady Gaga. Lady Gaga is an American pop singer-songwriter. She was seen on the red carpet of the Golden Globe awards when lots of paparazzi took pictures of her. She was seen with Elton John. When Russell Brand said that none of the people who were at rehab with him were his friends, Lady Gaga gave him a dirty look, implying that she was in rehab with him. Manjula once said that Apu goes on about Lady Gaga all day long, and that she is doing nothing that Rava Khatan was not doing 20 years ago while she was a member of Parliament. 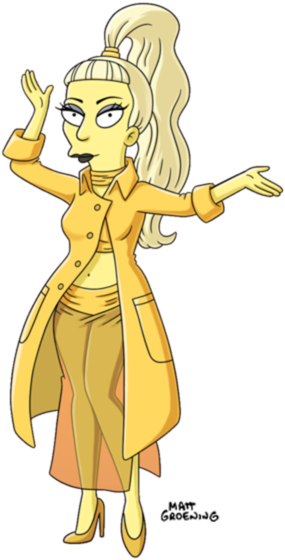 Lady Gaga was coming through Springfield once on the Lady Gaga Express and noticed how they had so much low self-esteem. 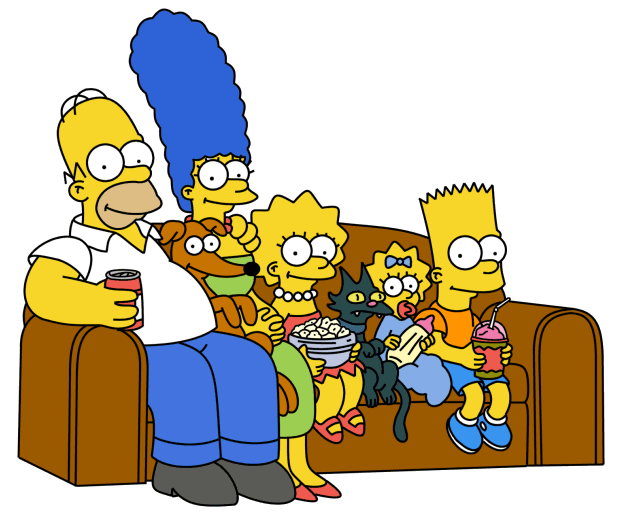 She managed to cheer everyone up except Lisa and Moe and spent all her time in Springfield trying to bring Lisa out of her mood. 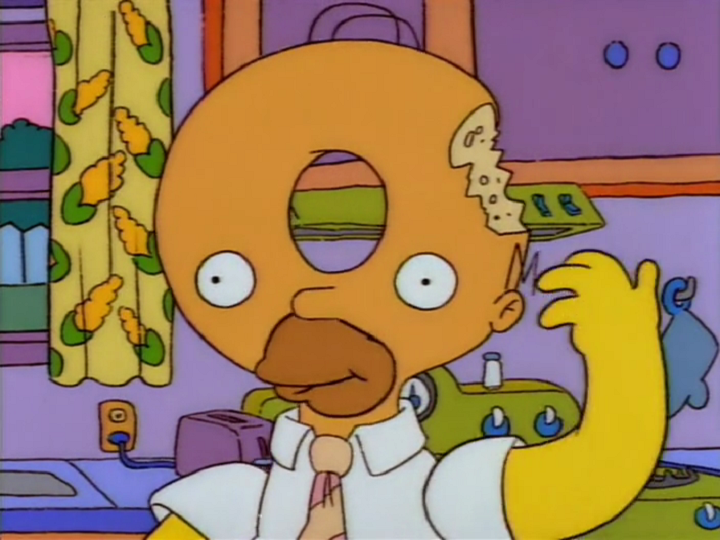 She eventually managed this but told Moe that he was a lost cause. A picture of Lady Gaga was on the wall of The Penny Loafer. The contents of this article or section are considered to be non-canon and therefore may not have actually happened or existed. Principal Skinner told Nelson that he would serve detention until the end of the school year, or until Lady Gaga said detention was bad. She was once parodied as Lady Pumas. 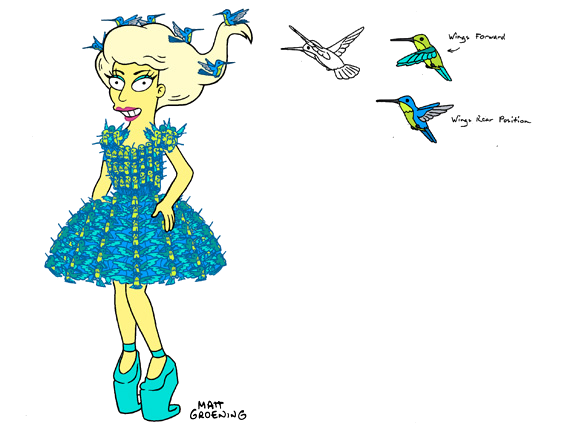 An archive image of Lady Gaga in a concert from "Lisa Goes Gaga" was seen in the couch gag for "Looking for Mr. Goodbart". 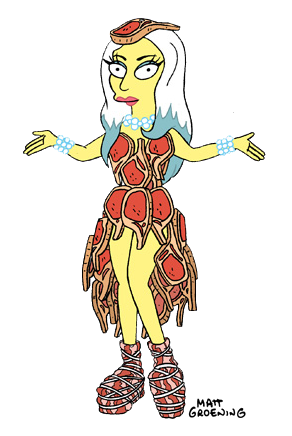 Wikisimpsons has a collection of images related to Lady Gaga. Episode – "Lisa Goes Gaga"
↑ "Angry Dad: The Movie"
↑ "I'm Just a Girl Who Can't Say D'oh"
Travis Barker • Pete Best • Buddy Budman • Paul Cook • Elvis Costello • Zack de la Rocha • Nick Delacourt • Mick Fleetwood • Bill Gibson • Jamaican musician • Joey Kramer • Lou • Paul McCartney • George Michael • Tito Puente • Bart Simpson • Ringo Starr • Hank Williams, Jr.
Billy Corgan • Chip Davis • John Lennon • Huey Lewis • Chris Martin • Michael Nesmith • Ozzy Osbourne • Sting • Hank Williams, Jr.
Paul Anka • Billy Corgan • Elvis Costello • Peter D'Abbruzio • Zack de la Rocha • Donald Fagen • Sean Hopper • Elton John • John Lennon • Chris Martin • Linda McCartney • George Michael • Ozzy Osbourne • Pool Sharks salesman • Sting • Hank Williams, Jr. 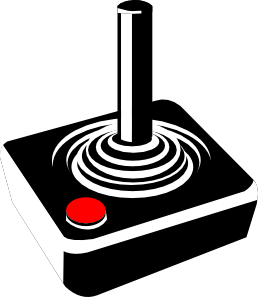 Modified on April 8, 2019, at 16:02.